Come get your electrons & solder on at Pumping Station: One’s Circuit Hacking Wednesday (2nd & 4th of the month)! 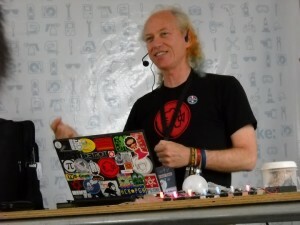 Mitch Altman (co-founder Noisebridge & TV-B-Gone inventor) and Jimmie P. Rodgers (creator of the OpenHeart & LoL Shield) will be our special guest stars on Wednesday, August-25, 7pm-10pm. Inspired by Noisebridge’s Circuit Hacking Monday, any experience level is welcome. 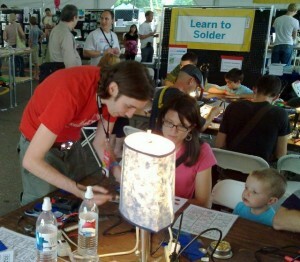 Beginners can learn to solder and make cool stuff in a couple hours. DIY electronics kits from Adafruit Industries, Cornfield Electronics (Mitch Altman), Jimmie P. Rodgers will be available for sale. 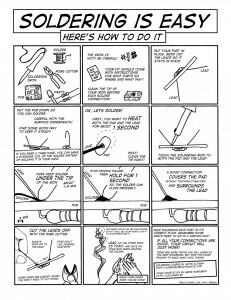 And remember: Soldering is Easy! Much better than my camera phone!